We are headed to BioEurope Spring in March. In addition to all the usual speed-dating, and receptions, I'm giving a short talk in the Startup Spotlight, Tuesday at 5pm on "Partnering Strategies for Early Stage Companies". Hope to see many of you there! We hope you enjoy this issue. What do you want to see in the next issue? Many licensing and partnership deals get terminated. Terminations can happen because the drug fails to show efficacy and safety or because the drug candidate is no longer seen as a higher priority for resources than alternatives in the portfolio. So what happens to the drugs whose deals are terminated? 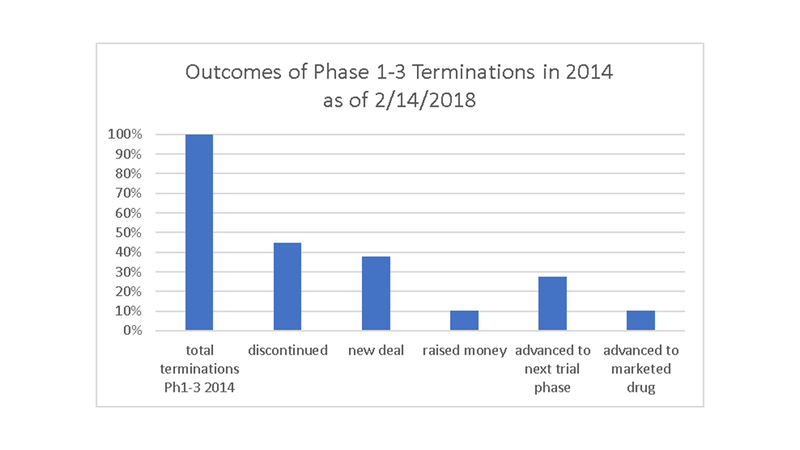 In 2014, about 20% of the deals for compounds in Phase 1 thru Phase 3 were terminated. For those 29 deals, 45% of the drugs had no progress in the years since the 2014 deal termination (discontinued in the graph below). But, the majority (55%) went on to have some positive result after the deal termination in 2014 (up to 2 14 2018). 38% of the terminations went on to get a new deal (perhaps not as good a deal). A few (10%) raised money to advance the drug. 28% went on to the next trial phase (some with a new deal or with new fund raising). 10% have reached the market. Note: some drugs have more than 1 positive outcome, and are counted in more than 1 category. These numbers are reminders to push hard for terms in out-licensing deals to get objective criteria for diligence, so that termination can be triggered by less than a lawsuit for absence of Commercially Reasonable Results. And upon termination, the smaller party wants the drug back with an orderly transition to enable the continuation of development as quickly as possible with as much data, formulation, manufacturing help as possible to get from the terminating partner. We have all heard of the value inflection with Phase 2 data, but for me, modeling it makes it more concrete, more apparent. 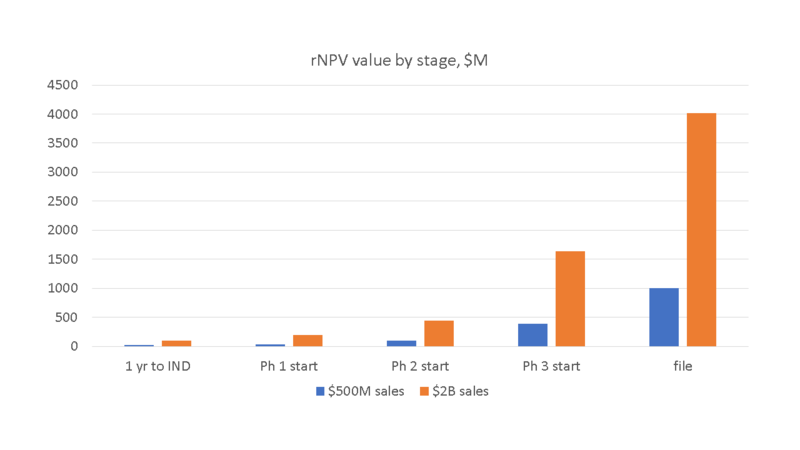 I modeled a the rNPV of a small molecule at 1 year before an IND, using industry standard probabilities for approval by phase (for a lead indication from Michael Hay, et al, 2014 Nature Biotech 32(1): 40-51), using 8% cogs, 15% cost of capital, and sales of $500M at 7 years after approval. With the assumptions seen in the figure to the left, the rNPV was $19M. If you increase the sales to $2B, the rNPV was $100M. Clearly, the sales potential makes a huge difference in value and is very uncertain at these early stages. 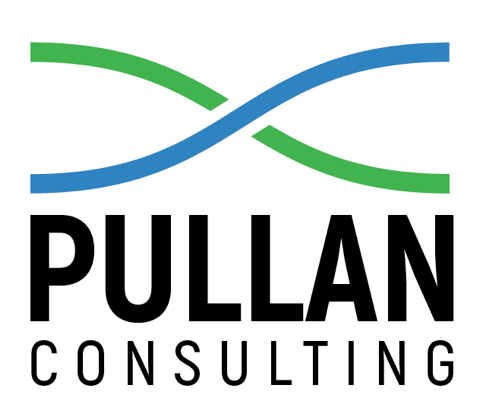 The value of a program is really heavily driven by the belief in its potential market size! But we can also see the impact of risk reduction by stage. If I just change the number of years to move the drug along in development, will all the same assumptions, I can see the value change by stage of development. 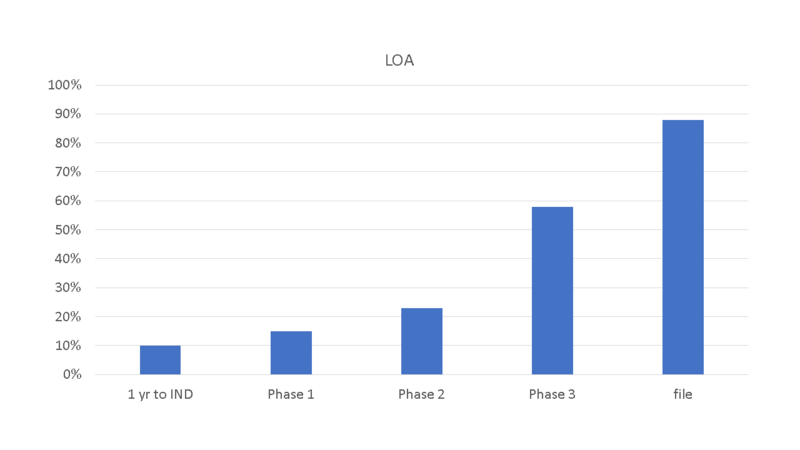 With $500M in peak sales, 1 year to IND is $19M, ready for Phase 1 is $40M, ready for Phase 2 is $101M, ready for Phase 3 is $394M and the rNPV at filing is $1B. The big inflection is the delivery of Phase 2 efficacy. Ready for Phase 3 is worth 3.5-4x the project ready for Phase 2. And this does not assume any change in the value due to competitive position; it is largely driven by the likelihood of approval by stage. The likelihood of approval by stage looks fairly similar. It is another reminder that risk reduction is a huge part of what we are all working to deliver in drug development! Joanna Glasner of Tech Crunch published an analysis (https://flipboard.com/@flipboard/-what-does-it-take-to-be-a-startup-that-/f-31911bb217%2Ftechcrunch.com) of startups founded in N. America in 2015 or later that have raised $100M or more in venture funding. What do startups that raise big money fast have in common? 1. Focus on cancer immunotherapy. 7 of the 39 startups that have raised $100M since founding in 2015 or later are in cancer immunotherapy. 2. Have a well-known founder. 3. Have a platform with applications in many diseases. 4. Get funded by ARCH Ventures and Celgene (who backed several of these fast risers). The dominance of cancer for VC funding is clear in this chart shared by John Carroll of Endpoints. More on who is funding in cancer can be teased by this graphic from CB Insights looking at where the cancer deals of the top VCs were going. Immunotherapy accounts for 62% of the cancer deals by these top VCs. Orbimed, MPM, and NEA have been the biggest investors in cancer IO. Third Rock Ventures did follow on investments in 4 of 5 cancer startups it id. Much has been written about expectations for M&A in 2018 given the two distinct forms of relief provided in the recent tax law overhaul. Coming out of the JP Morgan conference, the buzz was that 2018 could be an exceptionally acquisitive year as companies sitting on stuffed overseas bank accounts took advantage of the lower tax rate to get their hands on the money back here in the States. Bankers, of course, love M&A. But lessons from the past – and some current indications from companies with lots of money to spend – suggests that all that cash might not be burning a hole in their pockets. Think of it this way, if you received an unexpected and huge windfall, would your first inclination be to go out and spend most, if not all on some new purchase? Or might you think to pay down some debt, put some away in savings (i.e. 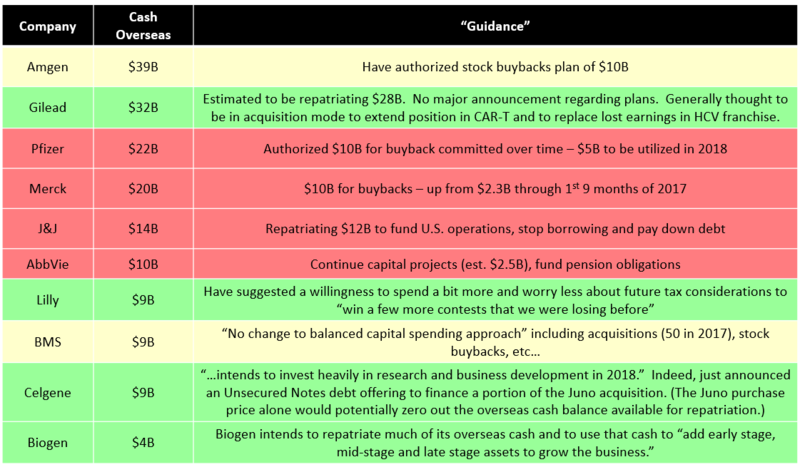 return cash to shareholders), and then do some investing…? It’s a matter of priorities and provides insight into how these corporate citizens view their individual paths to growth. Indeed, some companies with enormous stockpiles have already indicated new stock buyback plans and dividend increases. A short list of companies, overseas cash balance and their current posture regarding deployment of these funds is below (green = go). It appears that there’s going to be plenty of dry powder should company’s wish to pull the trigger on deals.